They don’t come any shiftier than Adam Schiff. We now know he conducted a secret meeting with Glenn Simpson, the founder of Fusion GPS, a D.C. research and intelligence firm. That’s the same outfit hired by Hillary Clinton and the DNC to dig up dirt on Donald Trump. They couldn’t find much so they hired an anti-Trump operative and British spy named Christopher Steele. He worked with Russians to fabricate what is known as the ‘Steele Dossier,’ which is now known to be a bundle of lies. Regardless, corrupt and politicized FBI officials such as Mueller, Comey, McCabe and others used it to obtain a rubber stamp FISA warrant that allowed them, to spy on Donald Trump and his campaign. 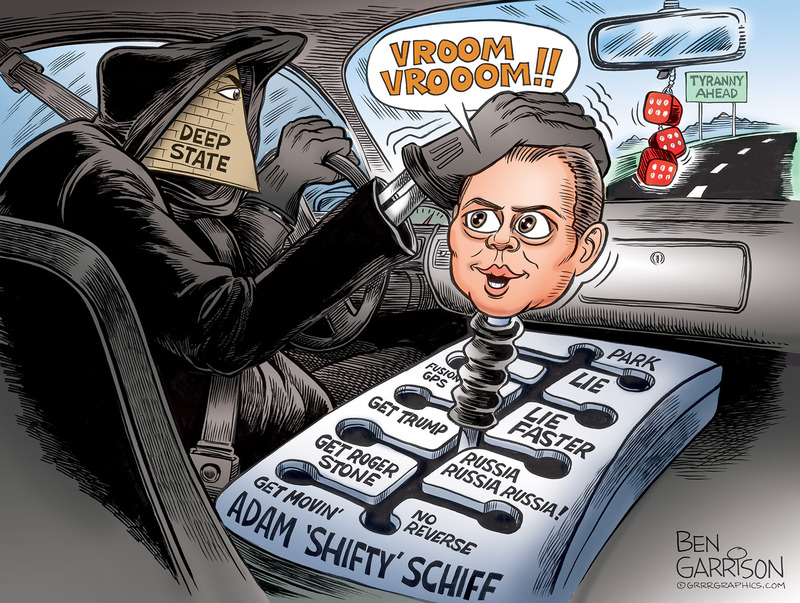 Shifty Schiff is a notorious leaker and weasel-like hit man for Hillary the Democrats. He made sure her ‘insurance policy’ was cashed in and used to hurt Trump as much as possible. Shifty Schiff constantly talked about Trump colluding with Russia when he knew full well that it was Hillary who did the colluding. The despicable bug-eyed California congressman also attacked Trump’s allies including Roger Stone. Shifty Schiff accused Stone of perjury before Congress, which led to Mueller’s ridiculous early morning raid on Stone’s home in Florida. Dozens of heavily armed FBI agents in flak jackets showed up along with a CNN crew, there to record and ramp up the drama. An FBI marine unit was deployed to guard against Stone escaping by sea. I can only imagine the cost to taxpayers. Hillary despises Stone, whose advice was instrumental in getting Trump elected, and so she assigned Shifty Schiff to destroy him financially by means of millions of dollars in legal fees. Unfortunately Shifty Schiff is now Chairman of the House Intelligence Committee, which gives him more power to engage in treasonous acts designed to take down a lawfully elected president. The Russia collusion allegation has long been exposed for what it is—a lie paid for by Democrats and then driven relentlessly by the Deep State. Shifty Schiff now wants the Russia investigation thrown into an even higher, grinding gear. He wants the harassment against Trump to continue no matter how unjust and destructive. 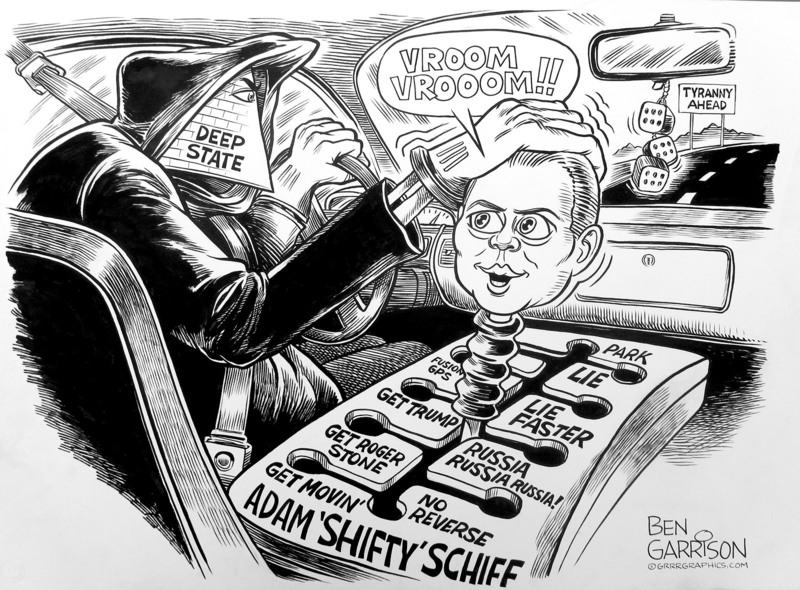 Shifty Schiff believes in turbo lies and overdrive. It’s time to put Adam Schiff in park. Permanently.